Planetside (PS), released in 2003 by Sony Online Entertainment, was a unique take on MMOs. There was no PvE component, and it was entirely action-based, just like a shooter. Players could go at each other in massive battles involving hundreds of people at once, with ground and air vehicles available to make things more exciting. Instead of clobbering orcs for experience and gold, players gained experience from fighting with each other, gaining access to more weapons, vehicles and special abilities as they advanced. One significant hurdle that PS had to clear was competition from the wider world of FPSes. They did deliver a unique product – a massive, seamless world with massive player numbers and a persistent battlefield – but the shooting mechanics were also a bit clunky, and the subscriber fee proved to be a turn-off for many players. It didn’t help that the graphics were rather mediocre, and that it was saddled with some early technical issues that made massive battles often an exercise in laggy frustration. It did work as a powerful proof of concept. For years, developers had largely stated that implementing real time action in MMOs was unfeasible due to technical issues. Planetside demonstrated that it could be done, and quite well. The game it most closely resembled was the Tribes series, although there were no jetpacks involved. 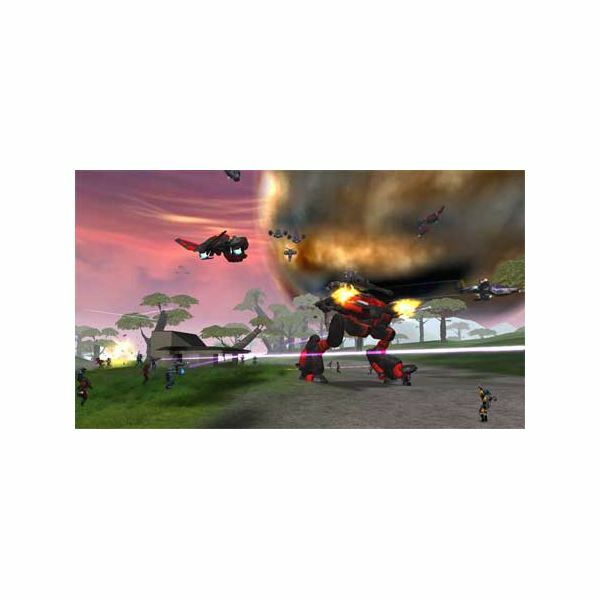 Players were split into three factions: Terrans, Vanu and the New Conglomerate, all who had different weapon sets and some unique vehicles. They competed over bases across a variety of planets, trying to conquer the entire galaxy. Although the shooter mechanics were a bit clunky, PS remains unrivaled in the size of the battlefields involved and the excitement that came out of running a combined arms assault. Air transports, bombers, tanks, fighters, specialized infantry and light vehicles could all combine together to conduct awe-inspiring battles that lasted for hours. At its best, well-coordinated squads vied against one another for dominance. At the worst, a mass of players would grind together until one buckled. There are a few reasons why PS never managed to break through to major success. One was the aforementioned competition from other shooters without subscription fees. The other major issue, really, was that it was quite repetitive. There were only a couple of different base layouts, and they were both boring, concrete-textured places with rather confusing layouts. You could expect to spend at least half your time in these boring, poorly designed places monotonously shooting at your enemies. It also took a fair amount of time to level up enough to get to use some of the more exciting vehicles and weapons, but you could still pose a threat to high level players even as a newbie.